Sporting Goods Intelligence is the most respected news source in the sporting goods industry. We're also the most read. More than 5,000 readers worldwide rely on us for substantive news and expert analysis of industry trends. 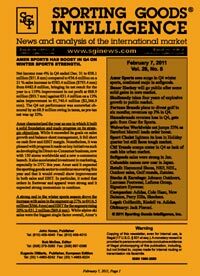 SGI delivers the news and analysis that matters, focused on the sporting goods marketplace and the emerging retail landscape. Every weekday, we send out our SGI NewsWire e-mail, keeping you current with up-to-the-minute industry happenings. On Friday, we send out our pdf newsletter, summarizing the week’s news and offering even more in-depth analysis. Try SGI and SGI NewsWire today! The strong are getting stronger. SGI covers the emerging companies in depth—winners and losers—analyzing the impact on the retail picture. SGI helps you understand these companies and their strategies so you can plan to market effectively to them or around them. And the weak are fading away. With major retail chains failing in the last few years, nearly everyone is a creditor. We tell you what's going on with the trade creditors committee… negotiations… pay-outs… and more. New developments on the international front. Every major brokerage firm interested in sporting goods subscribes to SGI. We have subscribers at all the major sporting goods companies. We are frequently quoted and cited in business publications including The Wall Street Journal, Fortune and others. Publisher John Horan has been covering the sporting goods industry since he created SportStyle in 1978. He has been publishing Sporting Goods Intelligence since 1984. European licensee Gene DiMaria has been covering this industry for nearly 30 years. This team has the contacts to uncover the news anywhere, and the experience to analyze and present the facts that are crucial to the health of your business. Need a key contact? Hard-to-find sales statistic? An opinion on an industry issue that’s burning hot at your company? Call or E-mail us any time for quality advice—but only if you are a subscriber. Sporting Goods Intelligence delivers critical and time-sensitive news and analysis to your desk every week. It's concise and to the point, written for fast reading. For just a few dollars an issue, you have access to information not available elsewhere—so you can make better decisions for your business. Check us out—no risk, no obligation! See for yourself if we're all we claim to be. You get 30 days to decide if SGI can help you make better decisions and take faster action in the marketplace. If you're not happy for any reason, just let us know and you'll get a full, 100% refund. After 30 days, you can cancel at any time and receive a pro-rated refund of your remaining term. Frequency: Sporting Goods Intelligence is published 50 times per year, weekly except for July 4th and Christmas weeks. Each issue is 8-10 pages. Delivery: Each issue is e-mailed in Adobe Acrobat® format or, for an additional charge, printed and sent First Class/Airmail. Timeliness: We close Friday morning and print and mail Friday afternoon. E-mail subscribers receive their issue Friday afternoon.